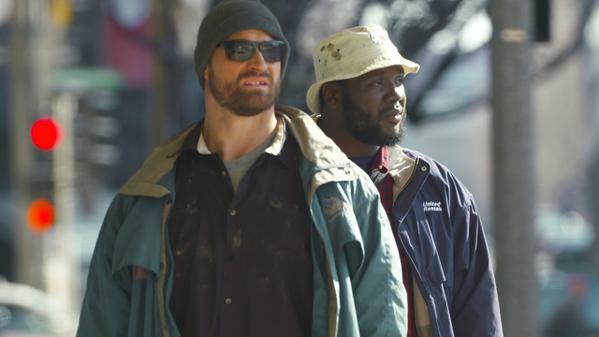 St. Louis Rams defensive ends William Hayes and Chris Long went undercover to experience life among the homeless, bringing awareness to an issue that impacts over 570,000 people in the United States. The NFL players went on a unique journey documented in a SportsCenter special that aired Sunday, and ESPN.com's Elizabeth Merrill wrote an in-depth feature story about Long and Hayes to provide context. "We were supposed to stay in a shelter after our first night on the streets before our cover was blown. [...] We were apprehensive about allowing those cameras along with us in our experience. ESPN hit us up a few days before. I think raising awareness is important on a lot of levels but the thing I took away was the human element of the problem. Awareness can't fix everything, and just 2 days and a night on the street didn't give us any answers. It did however give us perspective. I hope that I can give more of my time, energy and resources to the cause in the future. William has been a real champ the last few years. I do regret not being able to stay out longer. A stay in one of St. Louis' shelters would have been very valuable. We were found out day 2." The report by Merrill includes the footage and indicates the idea to don a homeless disguise was hatched on the Rams' team bus. Hayes initially recommended it to Long, who decided to join him. Hayes and Long hit the streets March 22, with makeup and clothing to mask their identities. They each had just $4 and resorted to panhandling as a result. After a full day on the streets, the two were told to leave while they were setting up to sleep outside of an abandoned warehouse. Hayes and Long then resorted to sleeping in the back of a stationary truck that wasn't fully covered on an evening when temperatures dipped to 38 degrees Fahrenheit. The Rams players returned to the warehouse to meet a man named Marty who had been living there with a woman named Nancy. Upon speaking with each of them, Hayes and Long decided to take them out of the warehouse and give them each a place to live for two months. The Rams helped coordinate Hayes and Long's plan to be temporarily homeless, so perhaps other NFL teams will rally around similar issues to raise awareness.